Could iFidelity help a one word message look professional? 1) What is the point of iFidelity when most email is just plain text, without tables and sections and graphics and doclinks? 2) My clients are all moving to Notes/Domino 8.5, so won't that fix most of these rendering issues? Both are good questions. I'll pose one back: what do most management people like to use with their email that is improved in Notes 8.5? Let's assume that I would like a slick, professional signature block that reflects my status. (Incidentally, you may not care about these things, but would the CEO or your boss?) I use Notes 8.5, so I add my signature and say it should go on every outgoing message (although this example would work just as well if I inserted with the action instead. Now, what would be the difference if I used iFidelity for Lotus Notes or just plain vanilla MIME rendering? The difference may or may not matter to you, but it will likely matter to your boss. And remember, this is just a one word answer. 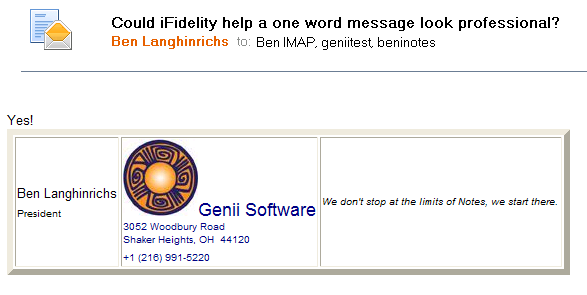 Here is my email in Notes which answers the question "Could iFidelity help a one word message look professional?" Note the rich text signature block below the one word message. How much will iFidelity cost? This is the first post that really constitutes an announcement. The pricing for iFidelity has been determined, and we are doing it a bit differently that we have for previous products. After feedback from both beta testers and various potential customers and resellers, we are focusing on a per user pricing structure that mirrors, to some extent, the IBM CEO pricing. With this structure, you can pay a set price per user and install iFidelity anywhere you like in your organization, on as many clients or servers. In order to make this practical, you must license all Lotus Notes/Domino users. This makes bundling iFidelity with Notes/Domino very simple, as there is a simple incremental price added on to the Notes/Domino cost per user. In some companies, there may be a need for a different configuration with only some users covered, in which case a per server pricing is also available. Client use including inbound rendering will not be part of this server-based iFidelity. Unlike other Genii Software products, there is no cost for the first year of maintenance/upgrades. The renewal price will be 25% of the original price, but will not be due until the first anniversary. * Maintenance and free upgrades are included for the first year. A maintenance and upgrades renewal fee of 25% of the original license fee will be charged annually, starting with the first anniversary. So, for a mid-size 500 person company, you spend under six dollars a year per user to get cleaner, more reliable, more professional email going out, and cleaner, more reliable, more professional email coming in. Do people remember search engines before Google? While useful, the number of results and the lack of well designed algorithms meant that you would wind up manually stepping through a lot of muck trying to find a useful result. Google transformed the search engine into something far more useful by getting a lot smarter at determining what you were likely to want to see. What brought this to mind today was another sour experience with Kontera. These "in-text" advertisements are popping up in more places, purporting to be "smart links" but feeling more like "stupid links". 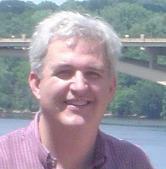 For example, I went to Niklas Waller's post on TinyMCE, and saw various links. When mousing over them, I would have laughed if it were not so painful. The contextual advertisement for "WYSIWYG editors" is shown below and has to do with book editors, the advertisement for "AJAX" had to do with the cleanser, and the advertisement for "browsers" had to do with Internet Explorer. What did these add to the experience? Nothing. The first two were not relevant, and only managed to muddy up the experience of the original post. The third was at least relevant, but given that I was using Firefox 3 to view the link, it still added nothing useful. Someday, Kontera, or somebody else, may figure out how to do enough analysis of the surrounding post to give useful results, but right now it is just a blight on the web content. In AVG 8,5, under Tools - Advanced Settings, expand the Web Shield section, click on Web Protection, and remove 80 from the list of Ports to be scanned. How stable and reliable is Genii Software? While this is an easier question to answer than the last, it is difficult for me to say because it feels immodest. 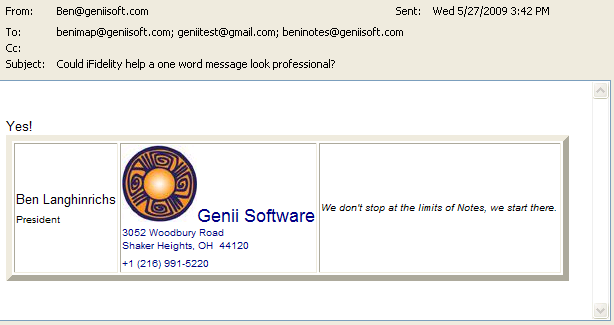 Genii Software has been around since 1994, and a business partner with IBM since 1995. Our first product, the @YourCommand Toolkit, came out in 1995, followed in 1997 by our best known product, the Midas Rich Text LSX, which has been licensed to over one and a half million users (the much maligned "seat count" that IBM and Microsoft love to both boast about and disparage). Since then, we have brought out the other Midas products (of which the Midas Rich Text C++ API remains), CoexEdit and CoexLinks. In terms of stability, we support these products across a great span of Notes/Domino versions, thus ensuring that customer needs can be met no matter where they have landed in the Notes/Domino world. All our current products are supported from R5 to ND8.5, and most would work with R4 if a customer came along who needed it. We may be small, but have outlasted many larger companies and have an infrastructure that allows for growth or constriction without threat to the company. It is perhaps indicative of our stability that the vast majority of our sales come through word-of-mouth, and yet we have grown virtually every year since we started. Customers know us, tell others about us, and come back to see what new products we might have to offer. Reliability is a harder thing to measure. I am aware of customers who rave about us, and a few who rave at us. It is perhaps a better measure that with the number of licensed users we have, with customers in 7 of the Fortune 10 companies, for example, with customers in 47 countries using our products in almost that many languages, we get very few support calls, and most are resolved within a matter of hours. Occasionally serious issues develop, which happens with all software partly due to the ever-changing landscape of accessory hardware and software products installed along with Notes/Domino and partly due to the ever-changing Notes/Domino products themselves and partly due to actual defects. When that happens, we work hard to be prompt and courteous in our resolution of the issues. When the support load seemed to be increasing, and more of it was needed in Europe and Asia, we contracted with The Turtle Partnership to provide most of our support, as they are larger and have more flexibility in terms of resources. Still, the best way to be sure is to ask around. It should not be hard to find people at IBM or in the general Notes/Domino community who will vouch for our stability and reliability. Those recommendations mean far more to us than a glossy brochure filled with empty promises. I am sure that if you have an old Lotusphere bag around, you can still find those brochures and promises from a number of companies who were formed after Genii Software and who have now disappeared into the mists of time. How do iFidelity and CoexLinks differ? A customer last night asked about CoexLinks and iFidelity and wanted to know how they differ. There is between the products, in the sense that iFidelity can do everything CoexLinks can do, but it can also do much more and has a much wider audience. In a very simplistic sense, CoexLinks is for people who choose NOT to use Notes mail, while iFidelity is for people who DO choose to use Notes mail, as well as for those who do not.